This is a double-month edition so I shall keep my introduction short. There is only one thing on everyone’s mind at this time : the persistent drought. It looks like the El Nino effect will limit the rainfall in our region to less than half of what normally falls – we expect that animals will be moving constantly in search not of water but of food. Grazers in particular are in trouble (browsers still have a fair amount of leaves left) and we are likely to lose warthogs, buffalo, zebra, waterbuck and wildebeest in the near future. The heat adds to the problem. With temperatures reaching over 40C the monkeys landed up in the pond at Tremisana. On the positive side, the game viewing has been excellent. It was a great month for game viewing. The western side of Balule game reserve is green and has water at natural water holes. We woke up early ( 04h45 ) yet everyone was happy. At our Tremisana front gate two big elephants bulls kept us waiting for twenty minutes. Along the Olifants River we encountered waterbuck, impala, giraffes and four buffalos taking a mud bath. At Tremisana Dam I switched off the engine and heard buffalo. We waited for the buffalo to get to the dam – it was an awesome sighting. After a few minutes I spotted a lioness walking towards the dam and my guests saw another eight lions behind us. They started attacking the buffalos. All the buffalos came together immediately and fought back – it was difficult to see because of dust and it was scary to be in between the lions and buffalos. Most of my lady guests were crying because they were scared. In the end there was no kill and the buffalos got away. The hippos and crocodiles have been a common sighting along the expansive Olifants river system. We came across a crocodile on foot – as soon as it registered our presence, it ran straight back towards the water. We encountered a few elephant bulls on foot. We enjoyed them from a safe distance. On one occasion a bull elephant picked up our scent, and headed towards us. Thanks to years of experience I was able to get my guests to a safe spot, and the elephants lost interest. There have been a variety of animal tracks found on bushwalks, ranging from aardvarks to black rhino, adding to the all-round bush experience. The Sunset Drives in Balule have been great. White rhino sightings have been good. The black rhino have given us few beautiful sightings including a mother and calf. The calf is almost one-year-old, and is growing quickly – it’s almost half the size of its mother. The elephant herds have been seen near our beautiful Marula Boma, where we enjoy our starlit dinners. During a Sundowner Drive I came across one of my favourite sightings – a leopard. We had spotted some impalas. The impalas were all looking in a similar direction and began snorting. This is a warning sound, usually made when a predator has been spotted. It sure was a predator, a beautiful leopard began moving through the bush, not far from the impala. The leopard’s cover had been broken, and it knew the hunt was over. A great sighting not far from the vehicle. The last of the big five encounters come in the form of lions. While taking another Sundowner Drive we came across our Olifants West pride. The pride consists of three females, one male and six cubs. We happened to be a few metres away from the big male, the females a little further back. Great off road experience with lion pride. On the 1st of the December, we had a good day in the Kruger despite hot conditions. We started with lions, trying their luck with a herd of buffalo. Not long afterwards, we spotted a white rhino across the river, sleeping in the shade. At Nsemani dam, we found a leopard. While driving along the main road, heading towards the S127, we came across three cheetahs crossing the road. A very good day which also included a honey badger. On the 21st in the Kruger, we had a great start with two cheetahs crossing the road,near Orpen.. Hyenas at the Talamati turn off, resting in the shade. The Timbavati river bed provided lions once again, resting in the river bed. Nsemani dam once again provided the leopard, with an excellent sighting as it lay full length in a jackal berry tree. On the 24th we had the big five all ticked off. A leopard sighting along the S125, found in a sausage tree with a young impala. Elephants all along the dry river bed. A big bull white rhino resting near Mazithi dam, with a small herd of buffalo not far off. The lions were seen along the S100, lying panting in a bed of reeds. The 25th – Christmas day – treated us to some superb viewing. Along the S 86 we found our leopard. The lions were eating away at a recent buffalo kill along the Timbavati river. The rhino joined the party later on in the day. An interesting sighting came in the form of a southern ground hornbill, beating into the shell of a leopard tortoise. It was a MERRY day indeed! The lions had found themselves a nice open spot to sleep, the big male lay there flat on his side – he wasn’t interested in moving. The females had placed themselves a little further away, alongside a small ditch filled with tall reeds. We watched as they lay twitching their ears, slowly starting to wake up. The heat of the day had drawn most of their energy from them, it was starting to cool down as the sun disappeared. We continued watching these large cats, and began to think that maybe they had something in the tall reeds. Much to our pleasure, they had hidden their young cubs in the reeds. My guests and I had the pleasure of watching mom call her cubs and walk them up the bank, towards the water hole. The rhino has been a big talking point, with large numbers been poached for their horn. It’s the days when you see mom with her young calf, that your heart fills with joy and hope that this prehistoric species, still has a chance. It was a particularly cloudy day, usually good for game drives. We had driven around for quite some time, enjoying a variety of animals and even insects. The highlight however was coming across a beautiful black rhino, with her new calf of only a few days. The little guy, was all feet and ears. A wonderful sight to see, as he walked behind his mother, trying to imitate her every move. 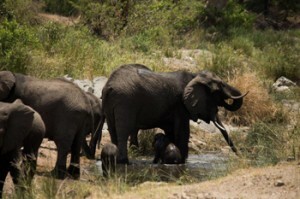 We had already seen the big five, the day had been incredible. I didn’t think we would end up seeing a cheetah too. It was the end of the day, it was time to head home, but nature had one last surprise. Right next to the road in front of us, stood a cheetah. We stopped and watched as it eyed a small herd of impala in the distance. The next thing we knew, the cheetah was gone and the impala had scattered in all directions. It must have taken no less than five seconds, until the cheetah had taken down one of the impala. It was an incredible display of speed and agility; those were five seconds I’ll never forget. What an amazing month… Sightings were amazing and on Christmas day we were blessed by lions everywhere!! It is not the easiest thing on this planet to find animals due to the fact that they are always on the move and very unpredictable but this month was really great. Had a lot of lion sightings and a leopard walking past while we were looking at a breeding herd of elephants. Bushwalks are very fun and we get to see a lot of animals while on the walk. This month the Elephants waited for us at our vehicle instead of around a bush. We saw a few Bulls and also a breeding herd with calves. 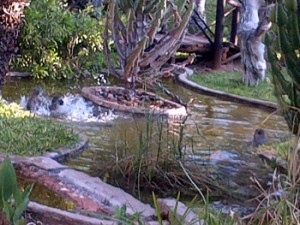 Our Hippo friends came and went due to the water levels dropping but they are finally back, hopefully for good. The lions have also been active around the river area. With the temperature building and the rain very scarce, the animals play a little bit of hide and seek. Some days we get to see them and other days we are lucky if we see anything at all. This month sometimes we got to see lions, elephants, buffalo and then all the general animals. The one good thing about the heat is that animals don’t move to far, so we get to see them a bit longer. Sunset Drives Some nights are amazingly busy and the others very quiet. It is not that we always get to show guests everything on the first night but some days we come very close to it. Amazing lions, elephants, leopard, hyena and all the amazing night animals. The last few night we got to spend the night eating at Marula Boma surrounded by elephants or hyenas. This time of the year is Marula fruit season but this year not many because was not enough rain. We see elephants but not a lot to compare with previous years. 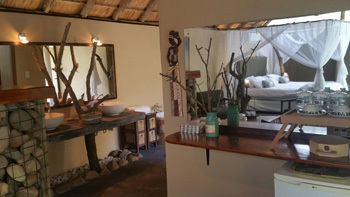 The lodge becomes popular place for big game like buffalos, giraffes, kudu and lions at night to drink water. Our Tremisana dam is still full and attracting so many animals and different types of birds. On our way back to the vehicle after the walk, just a few metres before we reached our land cruiser, I spotted a Black Rhino standing behind a bush.I stopped everyone and showed them the rhino. I told Philip to change direction to avoid getting too close and we also kept a safe distance to be safe and feel comfortable about the situation. Philip and I tried to take a long way back to vehicle, but the rhino moved towards the Landcruiser. I stayed behind to keep an eye on it and to make sure everyone is safe. It went on top of a mound and started make lots of noise. It was about 80-90 metres and it started running towards us at a very high speed. As it got closer and closer I loaded the rifle. I was moving backwards to fire a warning shot and I fell over a log behind me. The rhino was still coming at very high speed and one guest was on the ground screaming loudly – I had to protect her from the danger. Luckily the rifle was still in my hand and the rhino was right in my face looking around and make noise as well. I was able to shoot a warning short right in front of the rhino. I was close enough to shoot it, but this was not my aim. My plan was to protect the guests from danger. The rhino ran away immediately after the warning shot. We moved towards the Cruiser. The rhino returned ! Philip was already in the car and he drove towards the rhino to block it. Really scary and unforgettable experience!! We have nicknamed this rhino “Zulu” – no small wonder! Zulu really got close to Bongani. I stopped to watching impalas and to listen to the wild sounds. On Olifants road there were giraffe crossing the road and everybody was looking at impalas. I moved forward to view giraffes and behind the giraffes were two lionesses trying to attack. As we got closer, the lions started running towards the giraffe and giraffe moved away immediately. The lion keeps running after them for long distance, but they failed to catch a giraffe. On the way back from Marula Boma we found them again eating an impala – there were ten of them – two lionesses and eight cubs. There was not much left only few pieces of bones and skin. Bushwalk we saw hippo and crocodile in the water and one big bull elephant charging us. Before the walk, on Barnards we saw 2 new big male lions fighting with one big male lion from our pride of 10. The male of pride of 10 had bad injuries. We hope he can beat off the new males as they will probably kill the 6 subadult cubs if they take over the Olifants West pride. We have been watching these cubs since they were born and it will be terribly sad…………..
On 2 Jan I did manage to find the big five. The Lions were at S36 lying down at Rockvale waterhole, the leopard was not too far around the corner on Sweni Road roughly four km from the junction of where the lions were. Then further to my surprise just past the windmill we spotted a male white rhino with 2 females, a very nice sighting indeed. Later in the afternoon I saw buffalos at the Mudzandzeni Picnic spot as well as elephants all over the park that day. The 11th was another extremely hot day, however we did manage to get the big 5. The animals were spread all over the park so we had to travel all over to find them all, but in the end the Lions were on S100, the Leopard was all the way down at S125, and the White Rhino at the S90 junction. As per usual we saw elephants throughout the day and the buffalos at the Timbavati riverbed. On the 25th there were lots of lions at S100 again. 3 lionesses were lying down, 17km again we saw 6 lions and then the pride of 11, this was also a memorable sighting because we got a view of the famous White Lion cub. We also saw a Black Rhino further on into the day. On the 26th the lions had killed a Waterbuck at Phelwana bridge. We watched as they feasted on the carcass. At Timbavati riverbed we saw 3 lionesses stalking impalas..Also on the same road we caught a glimpse of a White Rhino before the first view point. On this day we also saw a Leopard in a tree that had just hung his warthog carcass. It was quite close to the road so it made for very nice pictures. The drought still persists across Kruger, with water levels dropping to extreme lows. The animals still seem strong in appearance. The man made water holes, are providing much needed respite. 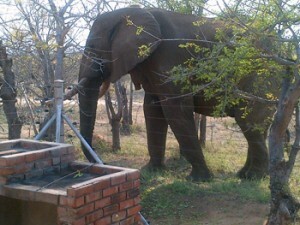 The conditions have however, provided me and my guests with some great game viewing. 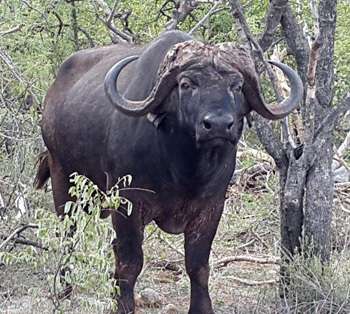 Buffalo still in fair condition. The elephants still seem to find water in the driest of times, thanks mainly to their keen sense of smell. We have stopped to view a breeding herd digging into the dry river bed, much to my guest’s surprise. The elephants begin to spray water, onto their large backs. The hole in the sand keeps getting larger as more elephants join in the digging, these new water spots are then used by other animals, like the zebra, impala, kudu and giraffe. The elephants are looking out for the animals, who just can’t dig or smell as deep as they can. The number of giraffe in Kruger is superb – these tall creatures, roam all across the whole of Kruger especially in the areas with high densities of knob thorn trees, one of their favourite meals. The sightings of cats had been great this month, but we haven’t seen many rhino. 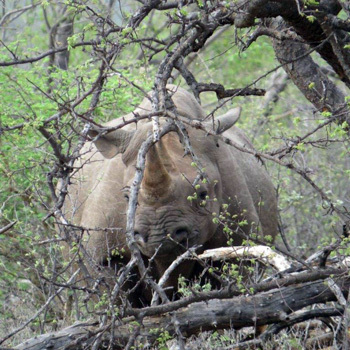 White and Black rhino are both present in Kruger. Unfortunately, this has make the Kruger a target for poaching. The future of these big mammals is not looking great if the current level of poaching continues. Walking in the bush is always nice especially when you are walking in different areas! We got to experience a lot of new behaviour of animals such as Black Rhino and Elephants. Daily on bushwalk we get a glimpse or two at some beautiful Elephants, Zebra and Impala. While lately on bushwalk we have been hearing the lions roaring which makes the guests nervous but very excited. After not seeing lions for a long time due to the lions having a feud about territory, we got very lucky by seeing a young male at the TREMISANA dam having a sip of water. This was a very big surprise for me due to the fact that I have never seen this young one before… Thing are starting to change… There’s new blood in the air and everybody is asking… Is The King of Balule going to win or will we get a new king ? Sunset drives have been incredible new and young life everywhere.. Baby Genets, Civet and Bush babies. And don’t forget about the Elephants, Hyenas and Lions that came to our Marua Boma in the last few nights while we were busy eating!!! 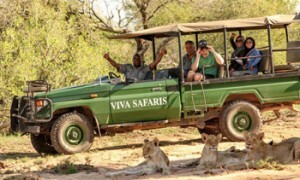 A drop in lion sightings this month has something to do with the exciting action with the Olifants west lion pride…. 2 other male lions have come and fought with the male lion of the Olifants west pride and managed to chase him off for a while but from what i have heard he is back in his pride and sustained some major injuries and as a result we haven’t seen them a lot, however there seems to be new lions that are coming through our property lately as they have been spotted near some watering holes. As for Kruger there has been some quite exciting things and there is clearly no shortage of lions in the Kruger. Leopards as well, the best leopard sightings seem to be in Kruger again lately…. I guess we just need the rain. On the up side we have been getting a lot of black rhino and elephant sighting here near Tremisana lodge and seeing the black rhino is no common occurrence. On several occasions I managed to find one of the female black rhinos near the river with her young female calf. She is beautifully docile and allows us to get pretty close to her young calf. Then on one of the drives back from a nice bush braai we managed to get a nice big old elephant in musth on the road but heading towards us so we reversed slowly back as we watched him walk closer and closer not caring at all. Eventually we realised he wasn’t going to divert off of the road and so Tanja and I decided to make a plan to get past, so we did it and slowly but surely the huge boy full of testosterone stopped in front of us and gave us a stare and then slowly came walking past us right next to the vehicle so that we could have touched him just about. And off he went into the bush with our stomachs in our throats were relieved and sooooo excited with adrenaline. On one of the days in Kruger we were really blessed to see a beautiful old female leopard right next to the road just as we got into the gate. It was awesome to see her up close not even 3 metres from the road -she was gorgeous. As we are still struggling to get enough rain, we had a few showers from the southern side and around Orpen gate where there seems to be life -the grass is starting to be more visible again. This month we had students who came to work in the local villages. Santa Monica college took a tour with us to Kruger park first day where we had a very awesome day in the park we found a very big pride of lions sleeping next to the road near Kumane dam they were lying scattered on the side and of the road with no much movement. For the second time having to see wild dogs this month it was very exciting with the pack of about 30 of them chasing impalas around near Orpen gate as we drove into nearby sighting the only thing we could see its impalas running across the road at an alarming rate the pack all came down near my open vehicle and tried to regroup again after an unsuccessful hunt. I joined Viva Safaris on the 1st of January 2016. I have worked for Sanparks since 1999 as a junior guide and in 2005 I was appointed as senior guide. In 2007 I was appointed as Head Guide at Satara camp. In 2009 I worked at Orpen till December 2015. I am now based at Tremisana lodge. I find the bushwalks along the pristine Olifants River really awesome. This month my sightings were so good : Black rhinos, huge elephant tuskers, lions, buffaloes and cheetah killing impala. This year, instead of holding the party at the Acornhoek Catholic church, we treated 30 young people accompanied by 2 teachers and Sister Francine to an unforgettable wildlife experience. Bongani and Marineo collected the kids from various outstations in the parish and brought them to Tremisana. After tea and cake in our Boma, they went on a bush walk with an armed Bongani and Morineo to Tremisana Dam. They were absolutely mesmerised by the Dung Beetles working on the fresh elephant dung around the water’s edge. Then onto the open vehicles for a game drive – luck was on their side with excellent close-up (and noticeably very scary) sightings of big elephants and tall giraffe! Lunch was a braai at Marula Boma. After ice cream, each child was presented with a shoe box filled with goodies such as toiletries, food and sweets. Thanks for these to the Catholic Church youth and Confirmation groups in Virginia, Durban North. 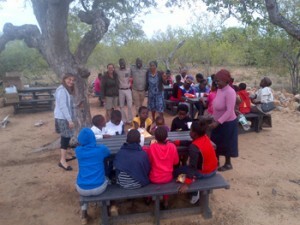 Sandy and staff with orphans at Marula Boma. Thanks again to Pick and Pay who, as always, generously supply a cooler bag filled with food items. The children regaled us with some wonderful singing and later presented us with a unique hand-made ( from used plastic bags ) picture that we shall proudly display at Tremisana. Thank you and God Bless ! We are pleased to announce that LUKE OVENDALE has been appointed as Camp Manager. Luke is an extraordinary young man and his rise from guide to manager in the short space of just over the 2 years he has been with Viva is testimony to his outstanding abilities and popularity. BONGANI MNISI has also been promoted – to Fleet Controller. We have many vehicles and besides doing a brilliant job as a most popular and likeable tourist guide, Bongani will ensure that our vehicles are in good shape. We are very fortunate in having appointed PHILLIP ZITHA to our guiding staff. Phillip has an amazing record as Head Guide in various camps in Kruger, most recently as Head Guide at ORPEN CAMP. He brings with him a remarkable track record and our hope is that ALL our guides will grow through interacting with and being mentored by such an experienced wildlife professional. This month was very hot. We had some real summer days with high temperatures. This month we had a few showers and nice thunderstorms. But it didn’t rain enough. The bush needs more rain, so hopefully in February. We still have a lot of visitors at the water hole in front of the lodge: vervet monkeys, baboons and warthogs during the day. A Marabou stork is coming regularly.. We still see a lot of baby and young animals. The vervet monkeys have a lot of babies now and there are 2 female warthog both with 3 young piglets. They are so cute and smart! They live behind the fence at our neighbour’s property and only coming to our waterhole for a drink. During the night we get sometime visits of honey badger, bushpig, civet and leopard. After a busy December and a busy first week in January the visitors numbers dropped a bit. But we still welcome new guests every day and they all have had a nice Safari with us. We had lots of fun together. Sadly we say good-bye to Vanessa who is returning to Australia. The animals at Marc’s are all congregating around Breakfast Dam and the Klaserie River. 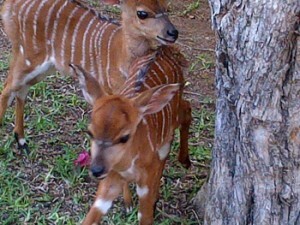 Young nyala are encountered near the grass planted around the swimming pool. Young nyala lambs at swimming pool area. KATEKANI TENTED LODGE is open for business ! We have two units ready as of 1 Feb 2016 and another two will open on 1 March 2016. Amazing interior of Tented Chalet. We have engaged some brilliant staff – all with previous experience in good 4 and 5 star lodges. We have developed a lovely A4 brochure and have sent these out to our regular supporters. We shall be pleased to post you some more brochures if you wish – please let us know. Thanks for your support in 2015. It started slowly but ended on a high ! We were 4 adults and took the 6 days Tremisana Lodge Safari. We enjoyed our stay so much, yes the schedule is busy but it’s worth it and the price for the money is excellent. The staff and guides are very friendly and knowledgeable, a special mention to Bongani and Morneo (guides) and Lianne (reception) who made a huge difference in our stay, they are amazing people! We were lucky to see so much amazing things, we will never forget our experience and it truly outreached our expectations. P.S please make sure to understand that these people are really trained for their jobs and do it because of passion, and you feel it. Do not hesitate to tip your guides and staff, they will never ask for anything but it truly makes a difference for them.